At least 14 people have died after Brazil's military swooped on drug gangs in Rio de Janeiro. Soldiers and armed police officers were involved in the raids in two impoverished favelas and a suburb of the city. The military command in charge of security in Rio, Brazil's second biggest city, said eight people died "and there could be more". Local media reported six suspected armed gang members were also killed after a car chase in the suburb of Niteroi. They were shot dead by police after a rush-hour car chase that caused traffic chaos near one of Rio's main bridges, according to reports. 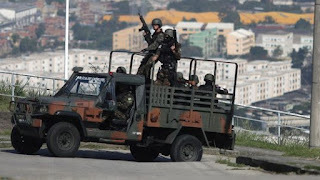 More than 4,000 soldiers, backed by armoured vehicles and aircraft, entered the favela complexes of Alemao and Mare, which are largely run by heavily armed drug traffickers.